18. Clotilde Dusoulier- Dusoulier’s 2003–vintage blog Chocolate & Zucchini is the Francophile’s dream. She posts from Montmartre about cheese and brioche—but also, to be fair, mochi and muffins. Her fifth book—her translation and adaptation of the 1932 French equivalent of Joy of Cooking, Ginette Mathiot’s Je Sais Cuisiner (“I Know How to Cook”),—is already iconic. Dusoulier is a Parisian girl who went to college for Computer Science. She worked as a Computer Engineer in both California and France for five years. She started her blog, Chocolate & Zucchini in 2003 as a place to record food she had eaten or cooked or bought or heard of. Fueled by some media attention, published food articles, and a new cookbook, she exchangedher life as a computer engineer for the life of a food writer. Along with Smitten Kitchen, Chocolate & Zucchini is one of the first food blogs that I ever stumbled upon (not StumbleUpon, just stumbled upon...). I do enjoy reading the blog, however, I have never happened upon a copy of either of Dusoulier's books. I'll make it a mission. To find out more about Clotilde Dusoulier, check out the about page at Chocolate & Zucchini. Combine flours, seeds and salt in a mixing bowl. Stir the olive oil in with a fork, and then mix in the water. When the water is absorbed, turn the mixture out on a clean work surface and knead the dough gently. Add a touch more water if the dough feels too dry to come together. You are looking for a smooth ball of dough that is not sticky or tacky. Divide the dough into 8 equal (basically) pieces, and cover with a clean kitchen towel or plastic wrap, so that it doesn't dry out. Preheat the oven to 400°F (200°C). Line sheet pans with parchment or a silpat. Roll one piece of dough at a time, as thinly as you can. You should wind up with long, rectangular-ish pieces. I rolled mine right on a marble slab with a rolling pin. If you use a wooden (or other) surface, you may have to dust it with flour first. Alternately, use a pasta roller. But really, this dough is supple and cooperative. Place on prepared baking sheets and score, if you wish (makes for easier separation after baking...I used my bench scraper). Slide sheet trays into preheated oven and bake for 7-10 minutes, or until golden. Transfer to a wire rack to cool. Continue with remaining dough. These crackers will keep for a couple of weeks if stored in an airtight container at room temperature. This is great, and just in time! 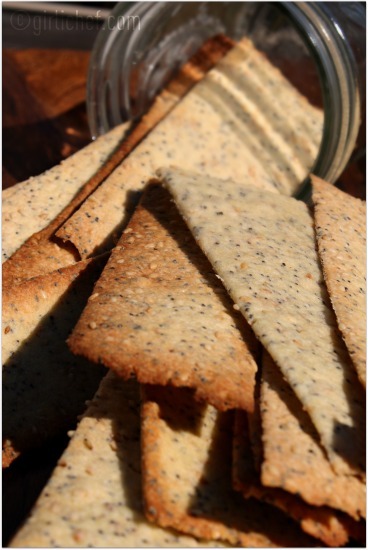 These crackers are fantastic Heather!They remind me of my favourite crackers from Costco! This looks like a fun recipe. I'm rolling pin challenged, but I'll give this a try because your crackers look so perfect. 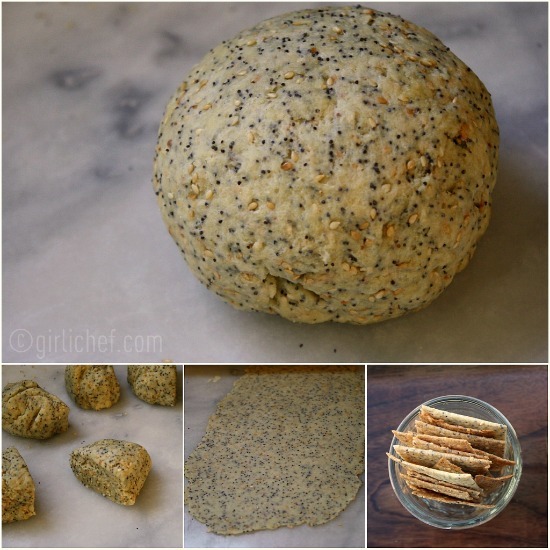 I love the ball of dough with all the seeds in it! I so enjoy reading your blog on the "50 women". 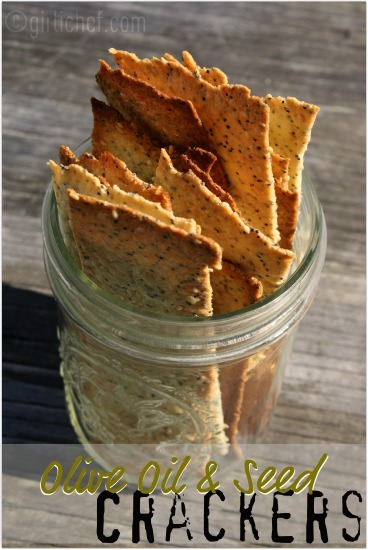 I have always wanted to make crackers, and this one is the way to go. I know what I'll be doing this weekend. I make crackers weekly for my personal chef clients but never for myself. Thanks for the inspiration. These look like the perfect little treats to go with cocktails! Cracker's never looked so enticing. Beautiful photos! I cook from Clothilde's first book regularly - it never fails. I love the look of these crackers! Tell the truth, though, were they really crunchy or kind of doughy? I'm such a snot about crackers, so if I make them, I really want them to be crunchy ... so the hummus or chevre is tough to spread without cracking the cracker! These look delicious and I would love to try them soon. Better bookmark it. Oh these look good - they remind me of some thin fancy crackers I saw at the market the other day. You rolled them out so nice and thin. I've never heard of Dusoulier, but now I'm eager to find one of her books as well! Those crackers look amazing...I'm going to try them with some brie first. I love anything that involves olive oil. Is there a specific type of olive oil you prefer? @Susan...yes, they were definitely crunchy. Roll them as thinly as you can and bake until golden to ensure crunch! Dusoulier uses a pasta machine, but since I don't have one, I just used elbow grease. But really, it didn't take much. I wouldn't even bother dirtying a pasta machine if I did have one. I tried baking some for the least amount of recommended time and some for the most...I like the ones that were a bit darker best. But yup, they were all crispy and crunchy! Those are delicious crackers, Heather! Super recipe! First time I've ever seen it....what a delicious cracker! I'm thinking these would be super fab for dipping into some hummus! Or just munching on plain. Wonderful looking crackers and I'll have to give them a try as I've never made crackers before. I did not know that she had another book out-my friend gave me one of her books that I just took again with me to Paris, with all sorts of tips, I enjoyed one tip about tea salons in museums, on a hot day in Paris, it was the perfect place to duck into for a break. I totally love the look of these crackers. Funny that I have visited Clotilde's blog many times - like you it was one of the first blogs I ever came across - but I've never made anything of hers thus far. 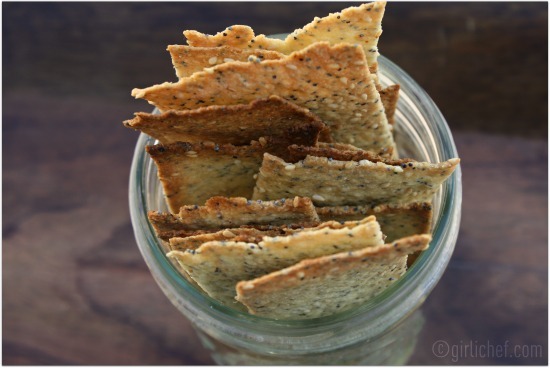 You've just changed that - I foresee a batch of these crackers this week! What a great project, and the crackers look amazing! These look perfect, and I have all of the ingredients to give them a go! I really need to get a kitchen scale though - not sure about the measurements. Lovely recipe, saving it. Las quiero hacer.... semolina flour , es lo mismo que corn meal flour de Aunt Jemima??? gracias !!! ok, gracias por la respuesta, aquí no la venden! luego veo en donde la consigo.